A good trip out. We wanted a carpet and were taken to a good place with a vast choice and pleasant experience. The argan place was interesting but expensive. Lunch was lovely sitting by the river. He told us that to see the waterfall would be a 2 hour walk and we ran out of time so didn't do that part. On the way back we stopped at a local farm to see how they live. Our driver was excellent. For us this trip was better than the two tours in the town. TOUR GUIDE RESPONSE: Hi am very very surprised but thank you. My great respect to you. The tour covered many sites worth seeing but could have been better arranged. We visited the Saadian Tombs but the queue for seeing the best tomb was very lengthy by the time we were taken there so we couldn't wait. We were told you could still see much from the tomb alongside but that wasn't the case. It would have been better to have gone there earlier before the crowds arrived so we could see the tomb. TOUR GUIDE RESPONSE: Thank you so much dear Caroline:Your family is wonderful and lovely. Best wishes for 2019. As first time travellers to Marrakech and with 2 young children we were fairly apprehensive but Mohamed put a perfect tour together for us and was amazing with our children, we will definitely be recommending him to friends if they ever go. TOUR GUIDE RESPONSE: Thank you dear Charlotte:I was nice to be your guide. I love your kids so much. They were so cute and lovely. Best wishes to you and to your lovely family . Excellent trip around the historic sights of Marrakech. Well planned and thoughtful commentary which was interesting, useful and entertaining. The kids enjoyed it too. Thank you! Mohammad was superb. He reached out to us via email before our arrival introducing himself and giving us some travel pointers for Marrakech. During the tour was friendly, knowledgeable, and it was an excellent way to explore Marrakech's rich and varied history. We would highly recommend Mohammad to anyone coming for a visit. TOUR GUIDE RESPONSE: Thank you so much. You are so lovely and i wish i could have spent more time with you. I hope to see you again in Marrakech. Best wishes. Do not enter Marrakesh Medina without Mohamed!He will navigate this huge complicated maze for you.He is knowledgeable,friendly,reliable,caring, & flexable. He aims to please, will customize your tour & is not a clock watcher.We hired him for 2 days, beginning in the art gallery section & continuing on to "behind the scenes"of actual artisans creating their goods-wood, leather,metal, &straw items. Rather than walking aimlessly thru the Medina,he made our experience meaningful, valuable, brought it to life! TOUR GUIDE RESPONSE: Thank you so much dear Sue .It is so nice to hear from you .My best wishes to your lovely husband and family. HIGHLY RECOMMEND! Mohamed is knowledgeable,reliable,kind,flexible,friendly,professional! He speaks perfect English & will customize your tour,aims to please & is not a clock watcher.We hired him for 2 days,specifically to help us navigate Marrakesh's huge Medina.He not only took us effortlessly through the complicated maze of endless shops, but also lead us to every part & to the artisans themselves!We would never have been able to find what we were looking for & get authentic goods without his expertise! TOUR GUIDE RESPONSE: Thank you so much dear Mark for your good feedback. It was nice to meet you. My great respect to both of you. Mohamed A. is an excellent guide. Our family of 5 thoroughly enjoyed his extensive knowledge and his kind personality. Our teenage children were captivated by the historical sites and the cultural experiences we shared with Mohamed. We highly recommend Mohamed (and his wonderful driver, Aziz) to fully enjoy Marrakesh. TOUR GUIDE RESPONSE: Thank you so much Sir for your excellent feedback. My Great respect to you to your lovely family. For Next time God willing . Thank you Mr. Mohamed for a great historical introduction to Marrakech! Thanks too for adding our requested stop to the tour. We really enjoyed your explanations and hospitality. We will highly recommend your services to our friends and family. Mohammad was great! We really enjoyed our food-focused tour and got to see markets and shops that we wouldn't have found on our own. Plus the cooking class he arranged for us was fantastic - really well organized and fun. I really feel like I'll be able to make the recipes again at home. TOUR GUIDE RESPONSE: Thank you so much my dear customers. You are so lovely that I wish all the best for you .I love you so much .You have made me feeling happy and proud.I hope to meet again. Mohamed A. was a remarkable and perfect guide to Marrakech. My friend and I arrived from the airport 2 hours after our tour was supposed to begin, but he generously, and easily pushed back the start time. Mohamed is articulate, friendly, funny, very on top of the history of the city and its monuments, and altogether the best possible introduction to Marrakech. He made us feel like we were locals, making it unexpectedly easy and enjoyable. I cannot say enough great things about him. Fantastic. Simply outstanding - can't recommend Mohamed highly enough. Outstanding tour. Mohamed went beyond the call of duty to customize our tour and help us have an amazing day in Marrakesh. Knowledgeable, thoughtful and patient - would give 6 stars if we could. Mohamed merkt man sein Studium in Soziologie an. Er ist erfahren und unabhängig. Er versucht nicht seine Gäste in bestimmte Läden zu bringen, um Kommission zu bekommen, wenngleich er die Souks von Marrakech gut kennt. Im Gegenteil: Er warnt davor, gibt gute Tipps, auch für die eigene Sicherheit. Wir haben viel gesehen und gelernt. Sehr höflich. Absolut empfehlenswert. Mohamed A. is an excellent guide. He is very well versed in the history of Marrakech and Morocco. We are a family of four. Our tour included trips to the souks, Jemma el-Fna; the Palais Bahia, and other interesting sights. Excellent arrangements were made for camel rides, quad bikes, horse drawn carriages, fantasia dinner and show. We visited a weekly Berber market and village. Shopping was great fun for all of us thanks to the selection of stores. TOUR GUIDE RESPONSE: Thank you so much dear Carlton for both your excellent feedback and for the wonderful photos you sent me.That was so kind of you.It was a great honour to be your guide. My best wishes to you ,your lovely wife,Lisa and Guabby. You are in my heart. I love you and I hope to see you again. Have a nice trip back home. Thank you. Mohamed A. is a very kind and considerate tour guide. He showed us around Marrakech successfully and also assisted us with a medical issue. He will gear the tour to what ever is good for your group. Mohamed is an extremely knowledgeable guide. He treats you less as a tourist and more as friend. Takes you shops and locations that are legit and places where we would not get swindled. He is able to adjust his bundles to your interests. We learned not only about Morocco and Marrakesh but also about Mohamed himself. I can honestly I look at Mohamed more as a friend and less as a tour guide now that our four day touring of Marrakesh has been completed. TOUR GUIDE RESPONSE: Hello my dear friend Adam:Thank you so much for you exellant feedback. Both you and Daniel were so friendly and "malih".It was really nice to be your guide and to have as friends that will stay so dear to me. I will always happy to meet you again. Take care. Our group was charmed by Mohamed - he was a very polite and caring guide, an educated person who showed knowledge in the area of history, art and culture. Mohamed complied with our requests to see places that looked interesting to us and at the same time he showed us other sights of Marrakesh that were worth seeing. From the beginning of our sightseeing to its end Mohamed was with us and he was telling very interesting facts for the things we seen all the time. Thank you and see we soon. Mohamed was such a wonderful tour guide! My cousin and I traveled to Marrakech and wanted to see as much as we could in a short amount of time. Mohamed took us everywhere and taught us so much about the Moroccan culture! We spent two days with him and felt so fortunate to have him as our guide. We spent one day in the city and one in the mountains. He took us around in a very nice car and took us to all great places! You are in very good hands with Mohamed! Mohammed was very knowledgeable about the Medina. I have three young boys 8-13 years and Mohammed made it interesting for them. He was flexible and created a tour that we preferred. TOUR GUIDE RESPONSE: I would like to thank so much Sir for your good feedback. It was a great honour to meet you and to be introduced to your lovely family. My great respect . 5/5, perfect tour. Independent guide with great knowledge and nice tour. TOUR GUIDE RESPONSE: Oh ! Quelle bonne surprise. Merci beaucoup. C'était un honneur de rencontrer une famille très sympathique comme la votre. Un grand bisou à vous tous sans oublier le papa. A une autre fois in Chaa Allah. The cooking class is not to be missed!!! While in Morocco, we tried as much of the local cuisine as possible, including the street food in the Medina. Absolutely wonderful stuff. The cooking class is a great thing to do if you enjoy cooking, which we do and a good rainy day activity. The staff at the school was top notch- very engaging, very warm and friendly people, which made for a lot of laughs regardless of the language barrier. I highly recommend this tour!!! TOUR GUIDE RESPONSE: There is no doubt that you are a family full of love and gratitude as I feel. My feeling towatds you were right. It was an honour to be your guide.Best wishes to you and to your wonderful family. The purpose of this trip was two fold, one was to shop for a rug or two, the other was to visit a village and see how the local folks live. Both were very enjoyable. Mohamed was providing us with good information along the 90 minute drive about history and languages. The shopping was excellent, what a treasure trove of beautiful handcrafted art. The local village was useful to put Marrakech in context, seeing how the local folks live. A very good tour that we will repeat in the future. After a less than satisfactory experience in Fez a few days before, it was with a bit of apprehension that we set out on this tour with Mohamed. It could not have been more enjoyable. The shops, in particular rugs and ceramics, are beautiful and reasonably priced. Mohamed also took to the work shops where goods of various type are hand made. There are also galleries selling exquisite works at requisite prices, but they are happy to have you come in and browse. A most enjoyable tour!!! TOUR GUIDE RESPONSE: What shall I say to a sweet family like yours more than I love you so much.Many thanks and you are always welcome home. Mohamed was an excellent guide. We learned a lot and enjoyed our walk through the souk market. Mohamed was a delightful, knowledgeable and protective guide. He knows his Berber and Moroccan history, and he was very helpful navigating the souls and provinding great suggestions for restaurants etc. As an independent guide, he saved us from being steered into poor quality stores, and his authoritative presence steered away the never ending stream of folks who otherwise always pester you in markets. Mohamed is a genuine person with obvious character and integrity. I would highly recommend him. We did two walking tours with Mohamed. One was the evening we arrived, just a short tour of the souks and Jemma el Fna square and then a longer one the next morning of the Bahia Palace, the Jewish quarter and hidden spots that we wouldn't have seen otherwise, giving us some insight into the daily lives of the locals. We thoroughly enjoyed our time with him, he has very good English, vast knowledge of the history of Marrakech and educates while entertaining. I would highly recommend Mohamed as a guide. Mohamed was an excellent guide. He was well-informed, interesting and entertaining. He took us to interesting places and accommodated our requests when we wanted to go to certain places. He was punctual and very helpful. I would highly recommend him. TOUR GUIDE RESPONSE: Hello Dear Irvine : Your excellent review has made excited and so grateful for you .Thank you so much Sir.You are really the salt of the earth or as we say here "salty" people.Warm regards to our princesses :your wife and daughter and happy marriage to Ali Baba and his beautiful wife.I love you and i hope to see you again .Take care.Sincerely yours; Mohamed A. 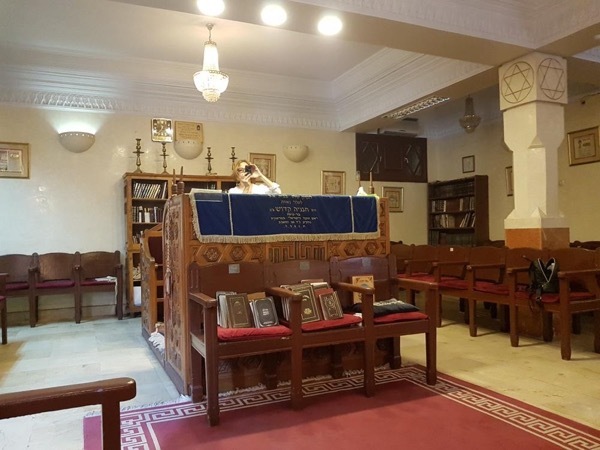 Unfortunately, the Jewish community in Marrakech is extremely small. As such, there is not much to visit after going to the Jewish Cemetery. However, I took the tour on a Friday and was lucky that the guide brought me to the one remaining synagogue where a custodian was preparing for services and provided us with a tour of the main chapel and the women's Mikvah where the water supply comes exclusively from rainwater and is heated by firewood. TOUR GUIDE RESPONSE: Thank you so much dear Claudia for your good review. It was really so nice to meet a person with a big heart like you. You are always welcome home. My best wishes to you. I love you.Thank you again. Ourika Valley was our 2nd experience with Mohamed, not only a very skilled guide, he also arranged a comfortable car and calm driver. Mohamed is a real professional guide and both his English and French are perfect. Excellent English, through knowledge of Marrakech, punctual and insightful. Saw only the Medina, Souks and the Square, thought we could do more. TOUR GUIDE RESPONSE: Dear Dennis:I also wish if we could have done and spent more time together that would be great. I hope that you enjoyed your holiday. It was nice to meet you Sir. Best wishes. Mohamed was pleasant, spoke clear English and very accommodating. His history discussions were most helpful regarding Marrakesh and we enjoyed the pace of his tour. Mohamed was a wonderful guide. Before we came to Marrakech, he communicated via TBL messaging always clearly and promptly. He was punctual for our tour. The van he hired was clean and comfortable, and the driver was excellent. More than this, Mohamed was a fun person -- interesting and with a great sense of humor. His English is fluent: easy to understand, and he grasps the meaning of idioms and the nuances of speech. We learned a lot from him and would definitely book a tour with him again. TOUR GUIDE RESPONSE: Dear Ardice and Paul: Your message has risen my ecstasy and given me a nice feeling full of emotions of love ,respect and gratitude . Believe me if i say to you that tears started dropping from my eyes .I am so happy to feel that you have enjoyed your holiday here and i wish to see you again.As promised i will send the photos via TBL as i do not have your e-mail address.Thank you again .Yours Mohamed. Nous avons passé un moment formidable avec notre guide, qui s'est parfaitment adapté a notre groupe, composé d'adultes et d'enfants. Nous avons determiné ensemble ce qu'on souhaitait visiter. Les explications etait très clair Encore merci et j'espere a bientot pour visiter le reste de cette belle ville! A wonderful journey with our group. A perfect guide! Danke für den wunderschönen Tag und die perfekte Führung! Mohamed will provide a very detailed historical tour for you. He is friendly and we enjoyed our time with him. He was able to adjust the tour according to our interests so we had more time in the places we wanted to spend time in. I would recommend him to anyone interested in a deeper cultural and religious history of the area. TOUR GUIDE RESPONSE: Hello Mr Mitchell Pratte . It is very kind of you to send a good review about the tour you had done with me .I liked your family and i also enjoyed the time we spent together .I did only my job and the fact that you enjoyed your tour makes me so happy .It was nice to meet you sir and you should come back for a longer stay .Best wishes yours Mohamed . Mohamed was a great guide and we would recommend him. We were lucky to have him guide us on our first day in Marakech as we were getting our bearings in this city. He has a nice, easy going personality and is very knowledgeable about the history of the city and Morocco. He showed us places that we wouldn't have known to stop in and this was such a positive thing. Mohamed was a most enjoyable and knowledgeable guide. We learned alot about the history of Marakech and Morocco and he was the perfect guide for our first day in Marakech. We appreciated all the tales of the city and historic background -things we wouldn't necessarily find in a guidebook. He was a super guide! My wife and two sons (9 and 12 years old) went on a four hour tour of Marrakech with Mohamed. We enjoyed ourselves tremendously. While Mohamed had a suggested itinerary he was also very interested in what would most interest our children. He has an amazing understanding of local history and culture and speaks perfect English. I would highly recommend hiring Mohamed to get a real sense of Marrakech. TOUR GUIDE RESPONSE: Hello dear Mr and Mrs Scarupa: First ,i would like to thank you very much for your message and compliment.Second,it was a pleasure and a great honour to be your guide in Marrakech.To people so nice ,so sweet and so cheerful i would say you are 'THE SALT OF THE EARTH' .Warm kisses to your lovely sons .Best wishes Yours Mohamed.